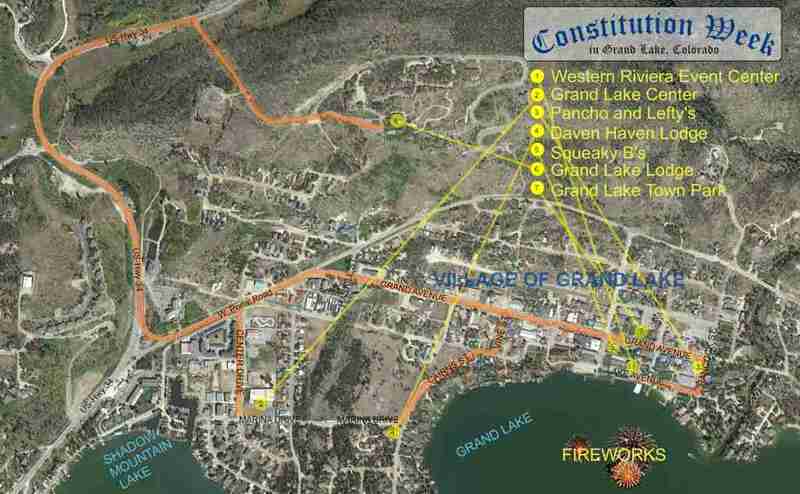 2018 SCHEDULE of EVENTS - U.S. Constitution Week in Grand Lake, Colorado the Premier and First Constitution Week Celebration in America! SUBJECT: "The Civic Virutes of Free Citizens"
SUBJECT: "66 Words of the Declaration of Independence"
SUBJECT: "The Dark Side of the Government Speech"
SUBJECT: "How Ancient Greece Influenced the Founding Fathers"
SUBJECT: "Nations and the Constitutions in Making"
SUBJECT: "Advice from Afar, Thomas Jefferson's suggestions from his perch as French Ambassador"
SUBJECT: "The Spirit of the Constitution!" SUBJECT: "James Madison: America's Greatest Constittional Lawmaker"
LOCATION: This Parade is in downtown Grand Lake. It will travel down the middle of Grand Avenue. It starts on the west end of town at Haskell Street and travels east until it ends at Hancock Street. Link to map at bottom of page. including BBQ Competition & Music Festival! TIME: 11:45am - Americhicks, Molly and Kim will kick off the celebration! Q coins will be sold, that can be used to purchase BBQ and beverages. TIME: 7:30pm - Stay, shop, and support the local community before our firewords display. EVENT SUGGESTION: BRING A CHAIR / This event is RAIN or SHINE. SUBJECT: "The Transformatin of the U.S. Supreme court since Earl Warren. LOCATION: Grand Lake's Town Square Park, downtown Grand Lake, Colorado. LOCATION: Over Grand Lake in downtown Grand Lake, Colorado.